Solid growth is expected in the home remodeling market this year, according to the Leading Indicator of Remodeling Activity (LIRA) released today by the Joint Center. While annual growth is expected to decelerate some by the fourth quarter due partly to the ongoing sluggishness in home sales, home improvement spending is still expected to grow nine percent in 2014. In the near term, lower rates of household mobility and lean inventory levels of homes on the market seem to be helping the home improvement industry. That coupled with an aging housing stock and deferred expenditures during the recession have owners catching up with delayed remodeling projects this year. Another factor that would normally help boost remodeling spending is low financing costs, but as described below historically low interest rates are not having the same impact on home improvements in current market conditions. Produced by the Remodeling Futures Program since 2007, the LIRA is a short-term indicator of national trends in home improvement spending. The LIRA is calculated as a weighted average of the annual rates-of-change of its component inputs, which are various economic measures that historically have had strong correlations and leads over remodeling activity. With the release of the First Quarter 2014 LIRA today, a decision was made to change the estimation model by removing the financial market conditions input (as measured by long-term interest rates), because the traditional relationship between interest rates and home improvement spending has significantly deteriorated in recent years. As seen in Figure 1, the impact of this change is slightly lower rates of growth in annual home improvement spending estimated for the past several quarters and substantially higher rates of growth projected for the next three quarters. Under the original LIRA estimation model, homeowner expenditures on remodeling projects are projected to increase about three percent in 2014, while the revised model projects spending will increase nine percent this year. Note: The revised LIRA model excludes 30-year Treasury bond yields as an input and reweights the remaining inputs proportionally. Source: Joint Center for Housing Studies of Harvard University. Major changes to the LIRA estimation model have not been common. The last significant change occurred in 2008 when the LIRA was re-benchmarked from the Census Bureau’s Residential Improvements and Repairs Statistics (C-50) to the Construction Spending Value Put in Place (C-30). The reason for changing the LIRA model at this time is because since 2008, the severe housing and the mortgage market crash and subsequent Great Recession has caused unprecedented volatility in many of the LIRA inputs including the financing measure represented by 30-year Treasury bond yields. 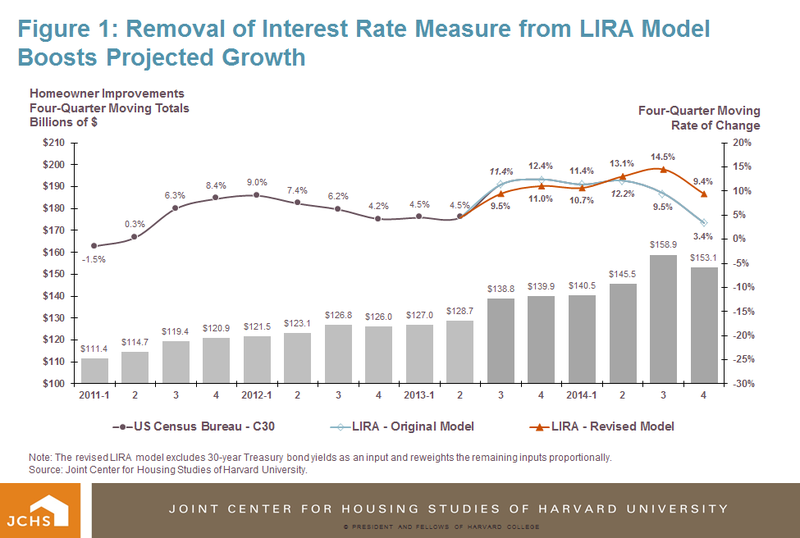 The theory behind including a financing measure in the LIRA model is that under more normal housing and economic environments, large home improvement projects are often financed by homeowners through home equity loans or lines of credit or cash-out refinancing of mortgages, and so the historically low financing costs of recent years would ordinarily encourage significant remodeling activity. Yet under the current conditions of a stalled housing market and still lukewarm economic environment, homeowners have not been able to take advantage of historically low financing costs because of much reduced levels of equity in their homes since the housing crash, as well as tighter lending practices of banks. For these reasons, the historically low interest rates of the past two years did not have the same influence on remodeling activity as in the past. Since the fall in rates did not result in a jump in spending, the recent rise in rates are also not expected to have as much of a chilling effect on remodeling spending as in the past. 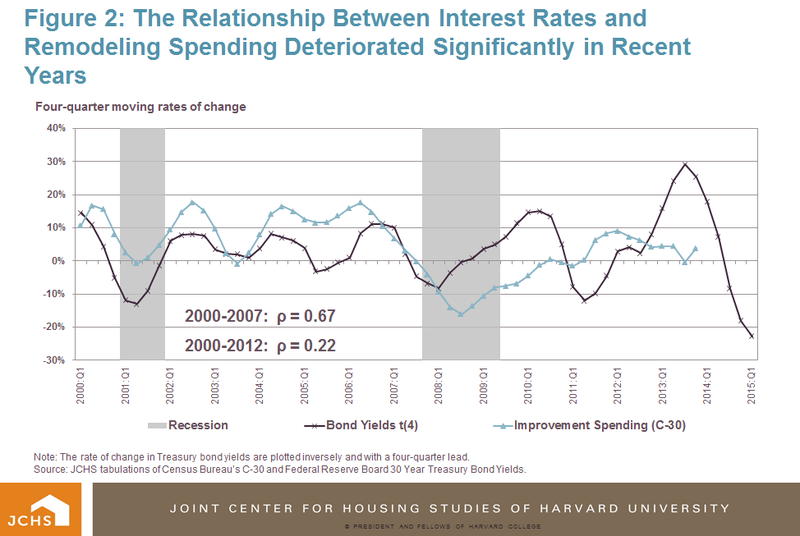 Indeed, as shown in Figure 2, the relationship between the annual rates of change in home improvement spending and 30-year Treasury bond yields was fairly strong when the LIRA estimation model was last updated in mid-2008 with a correlation coefficient of 0.7 between 2000 and 2007 (remodeling spending and interest rates are inversely correlated so that when interest rates increase spending declines and vice versa). While long-term interest rates are historically quite stable, since the housing and mortgage market crisis interest rate changes became unusually volatile as interest rates fell to historic lows and again as rates move off of these lows. Not only have interest rate movements become much more volatile, but the direction of change no longer correlates well with remodeling spending. 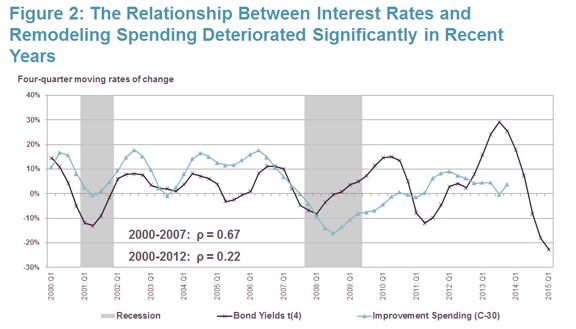 When including data from the more recent period that covers the downturn and recovery, the correlation coefficient between remodeling spending and long-term interest rates weakens considerably to 0.2 and in fact there is essentially no correlation between the two series after 2008. If the traditional relationship between financing costs and remodeling activity were still intact, much stronger growth in home improvement spending should have occurred when interest rates fell to historic lows in the aftermath of the housing crash, and now as interest rates return to their longer-term trend remodeling activity would be expected to decline considerably. Yet remodeling spending has seen relatively low and stable growth in the years following the downturn. Source: JCHS tabulations of Census Bureau’s C-30 and Federal Reserve Board 30 Year Treasury Bond Yields. Given the increased volatility in the C-30 benchmark data series and the LIRA inputs in recent years as the housing and home improvement markets have undergone severe cyclical downturns and sluggish recoveries, there is clearly a need for further testing of the LIRA estimation model moving forward to improve its stability. Each year on July 1st, the Census Bureau releases annual revisions to the C-30 for the prior two years, which provides a good opportunity for re-running LIRA input correlations and testing for further additions or substitutions of input variables that historically correlate well with remodeling spending, have strong leads over spending, and are also relatively stable over time. 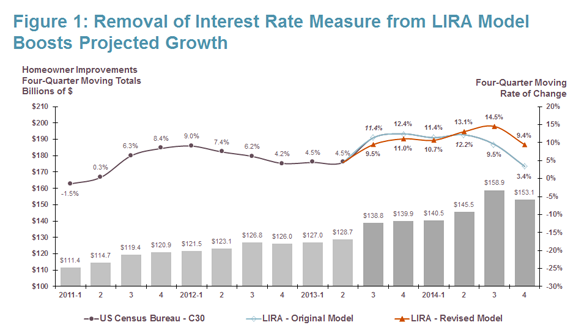 Any further changes to the LIRA model will be announced with the next quarterly release on July 24, 2014. For more information about the LIRA methodology and frequently asked questions (FAQs), please see the Joint Center for Housing Studies website.